Home » Mental Health Policy » On Optimising Specialist-Outreach. Has the Thiruvananthapuram (TVM) District Mental Health Program (DMHP) cracked that vexing and long persisting problem with specialist outreach? -a workable, dynamic and sustaining link with the primary care doctor to provide integrated psychiatric services at the periphery. Let us see what Dr Kiran, Consultant Psychiatrist and Nodal officer of DMHP at TVM District of Kerala State has to say..
As per Dr. Kiran organising a specialty psychiatry clinic once in a week at the peripheral center has worked well for TVM for the past one year. The visiting psychiatry specialist runs this clinic once in a month and the primary care doctor runs it for the rest of the three weeks. The advantage of this arrangement is that patients can move back and forth between the specialist and the primary care doctor based on their clinical needs. New cases and patients needing intensive clinical attention are sent to the specialist whereas patients on routine follow up and maintenance treatment are nudged to attend the clinic with the primary care doctor. Another advantage is that the psychiatric clinical load remains separate from the routine clinical load in the peripheral center and it gets evenly distributed between the specialist and primary care doctor. The timing of the clinic is fixed at 12.00 pm to 1:00 pm after the regular OP timings. As of now, it is working well for the primary care doctor, the patients and the visiting specialist doctor. A possible integration of the specialty psychiatric clinic with the NCD (Non communicable Diseases) clinics which are currently functioning in the peripheral centers is also being considered. WHO report which includes TVPM DMHP report. 1. School Program and Community Based Rehabilitation. 4. Plans for the coming years. 5. And finally the street play used by TVM DMHP for public education activity. Disclosure: Thiruvananthapuram is the author’s (Ramkumar) home town. 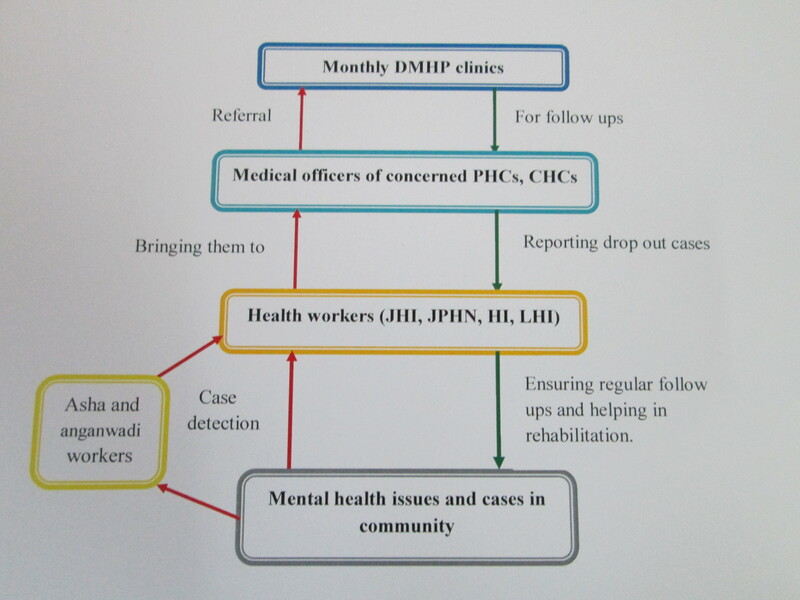 By kumarRam in Mental Health Policy, NIMHANS, Outreach Mental Health Clinic, Services & Policy on March 14, 2013 .